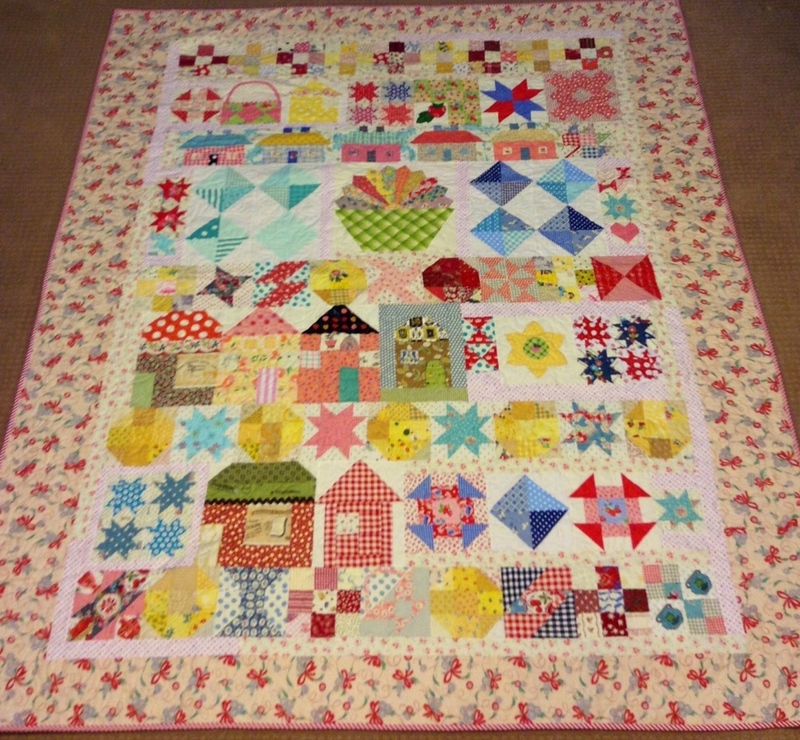 My Any Old Left Over Block Quilt is back from the machine quilter and bound. I love it. 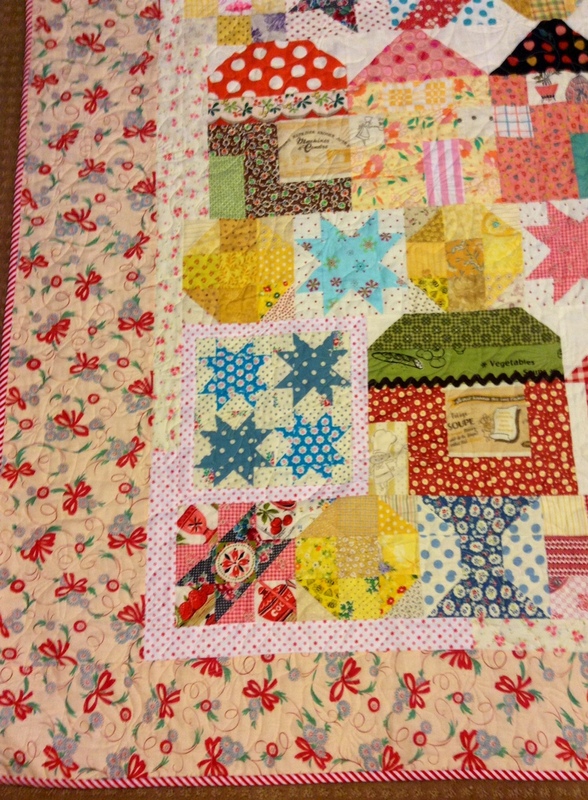 When I gathered up the blocks I wasn't sure how it would come together but I think it works. 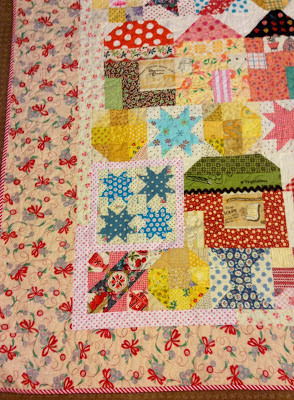 I named my quilt Any Old Left Over Block Quilt because that is what I was thinking when I gathered up the blocks and tried to make a cohesive unit. They were all just any old left over blocks and "old maids". The name came from a recipe in a cookbook I was given as a new bride (way back in 1979). You can find the recipe here. 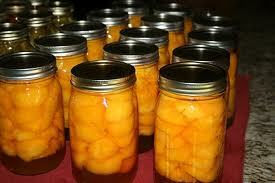 It is called Any Old Bottle Fruit Cake. Quite different from traditional fruit cake and quite tasty. I guess the cake concept comes from using up bottled fruit that might not be as pretty and fresh as when placed in the bottles. I think I was afraid my Any Old Block Quilt wouldn't be as fresh and pretty as a planned quilt. But I don't think that is the case. I used the new extra wide Robert Kaufman quilt back fabric. I really like it and it makes the back modernize the "old blocks". 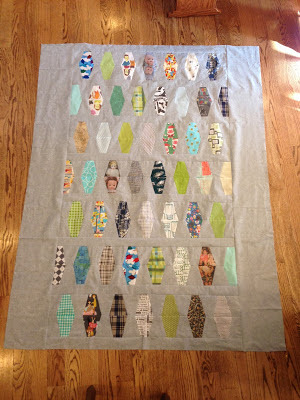 I first found out about this modern quilt back fabric from Katie's blog post. The fabric comes in great colors. I like all the colors except the black. I'm afraid machine quilting with light thread might show up too bold and contrast with the white circles on black. 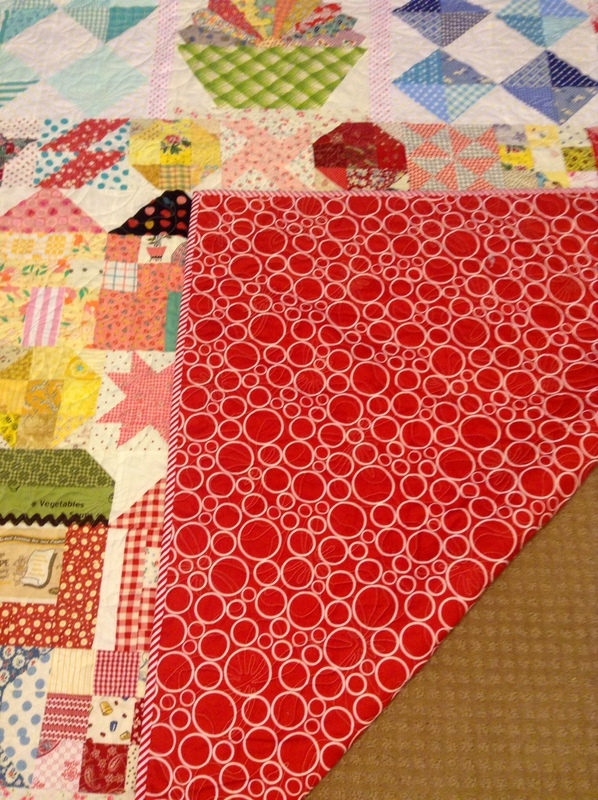 The blocks bring back great memories from trial blocks, pattern proofing, and cute little left-overs. 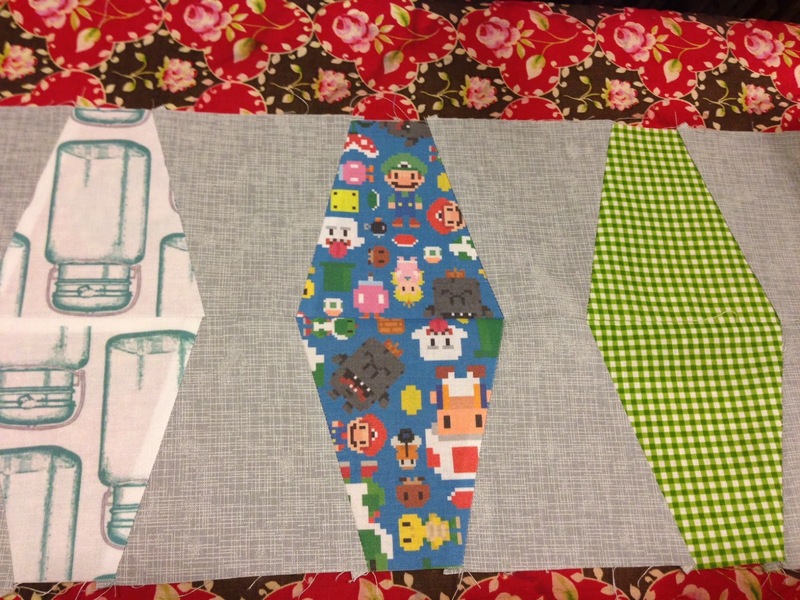 I can't decide where this quilt will live. I think it is too cute to fold and put on a shelf. 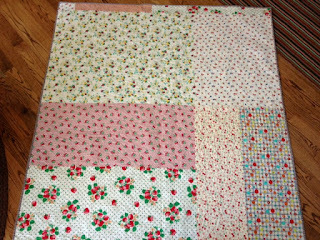 The border fabric was a fabric I've been hoarding. 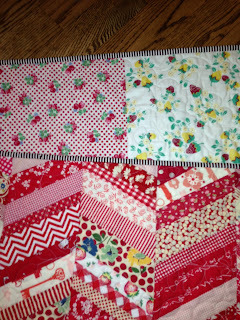 I took the machine quilting pattern from the bows in the border and had bows quilted edge-to-edge. The summer heat is here and it will be 99 degrees by the end of the week. My summer schedule is heating up too, but I will try to spend at least a few minutes most everyday doing something in my sewing room. 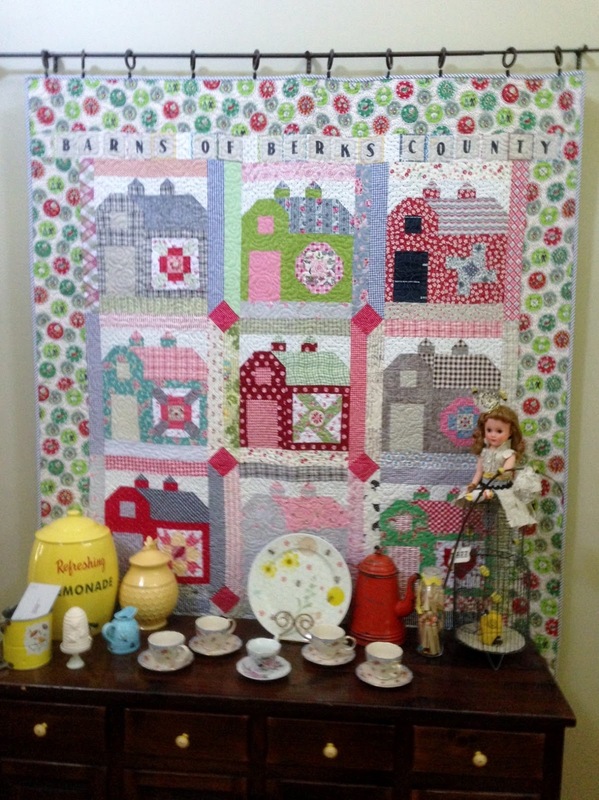 I switched up quilts in my entryway and decided to display my Barns of Berks County quilt for the summer. I know Lori is building even more barns and even a tractor, but I am delighted to have my barns finished and hanging up to enjoy. I finished Mason's graduation flimsy over the weekend. I know the fabrics may look kind of strange mixed together. I used Lori's tumbler ruler and made lanterns with fabric that represent things about Mason and some filler fabrics thrown in to balance things out a bit. The quilt turned out quite modern, which was the look I was trying to create. 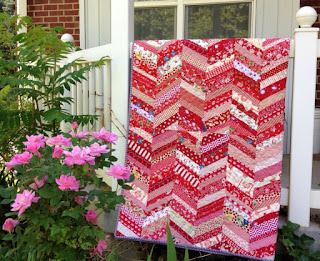 I'm going to take it to the quilter Thursday but I'm kind of wondering what pattern I want to have machine quilted into it. I'm so happy to have this finished and I really hope Mason will like it. I've always liked little things. Don't you? There is something so sweet and compelling about tiny cute objects. 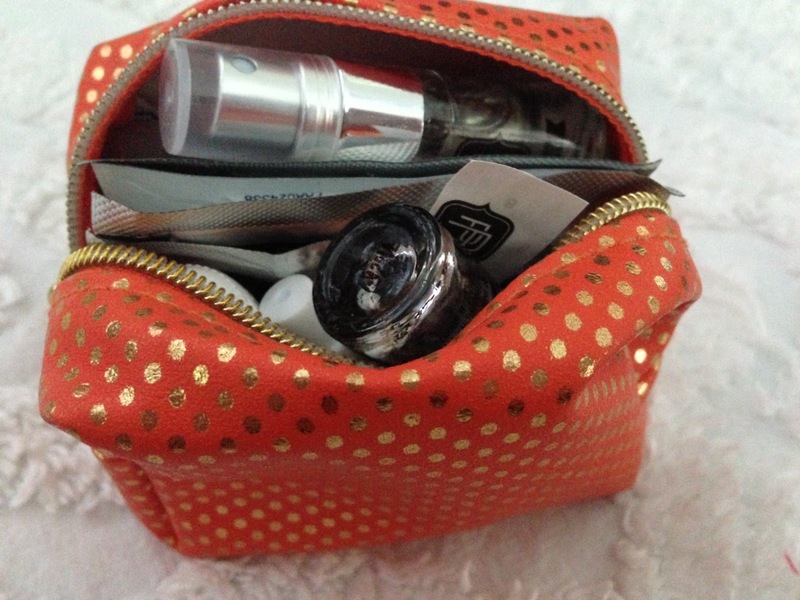 My daughter Natalie gave me this tiny little zipper bag to put in my purse. It contains little emergency aids. 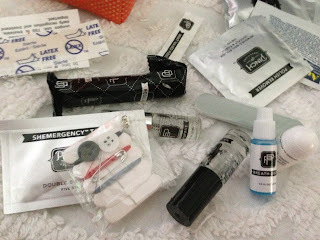 There is everything from a bandaid to sewing kit and manicure fixings. It is light and perfect to take anywhere. I feel prepared. And it is cute. When I was a kid I had an obsession for Liddle Kiddles. Some of you may remember these. The ones I had came in a locket but there were all kinds. 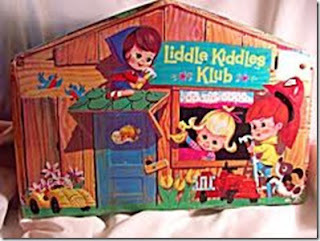 I even had this Liddle Kiddles Klub house. Boy, don't I wish I had this now. These things are pricey on today's market. Ebay has a selection but at crazy prices. I like little cute tissue packages. 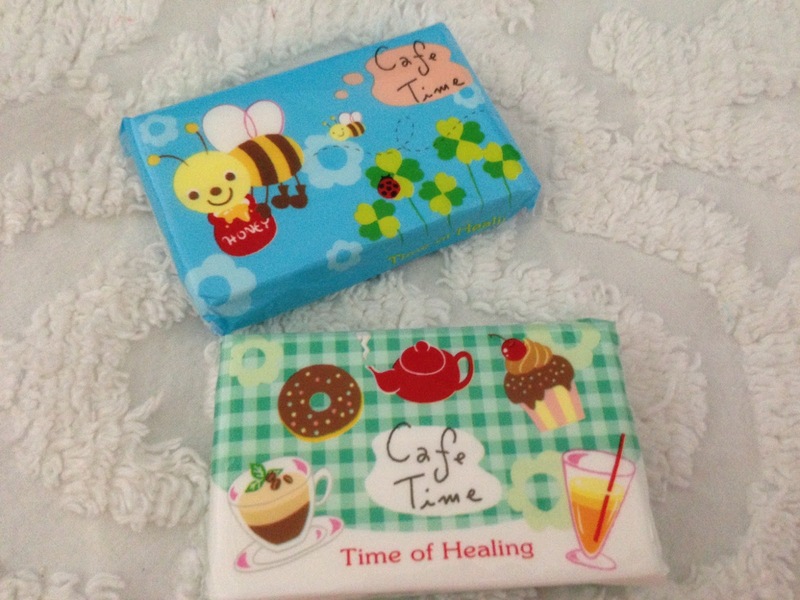 It is hard to actually use them because they are so darling but I bought a gross of them at Daiso (thanks PKM) so I feel like I won't run out. Achoo! My love for littles brought me to these little zipper macaroons. 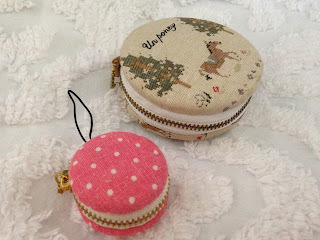 You can see how to make these here at Craft Passion. I haven't tried it yet but I do have all the supplies. I don't know why I'm so afraid to make my own. It is all hand work, however. And my love for littles attracted me to these little 2.5" charmers that I've been getting (and actually using). 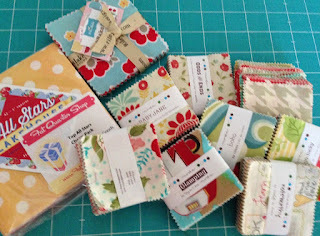 They are low priced and I can get every fabric from the line for well under $4.00. Etsy has lots of them. If I can't get a mini charm pack in a line, I'll sometimes get the 5" charmers. They are bigger but cute, too. Moda even came out with a pattern book for the minis. Do you ever collect little things? A few weeks ago for my birthday Lori met me for lunch and gave me a great gift bag. 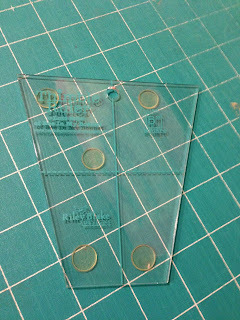 Among other goodies were 2 sets of Lori's rulers. 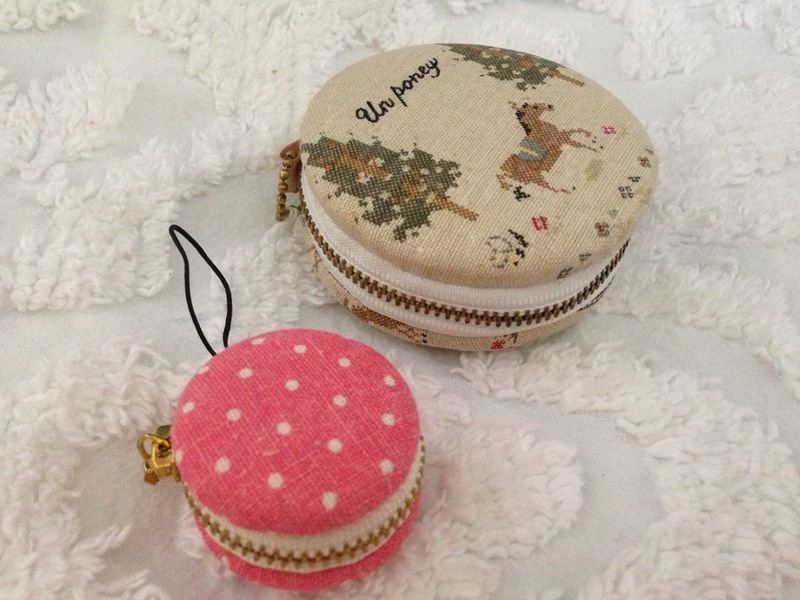 Lori calls this set thimbles. They are also called tumblers. 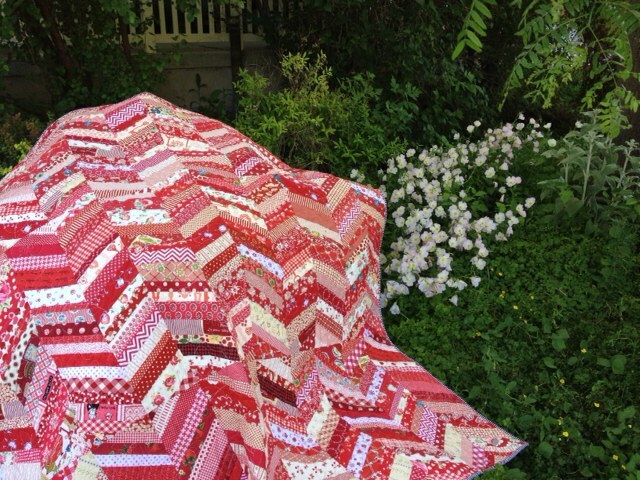 I have made tumbler quilts for years. They are so fun to make. 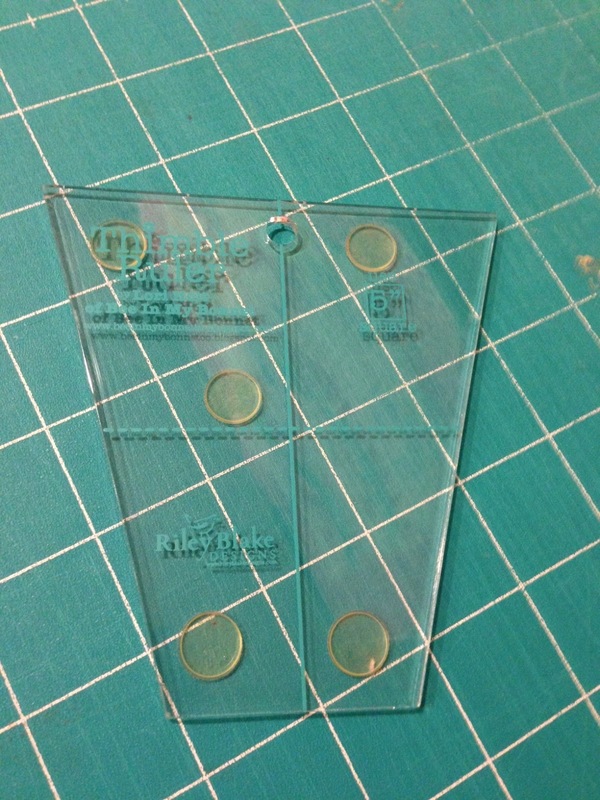 I had an idea I wanted to use this size ruler for a special quilt I'm working on. I'm making "lanterns" with it. I realize this may not look like the normal color or prints I use for my projects. But stick with me. 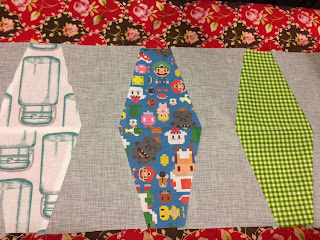 There are some strange or odd fabrics (spoonflower) but in the end when I'm done with this I hope you will see where I'm going with this. 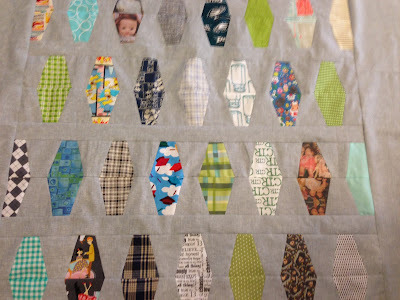 This quilt has a bit of humor attached. 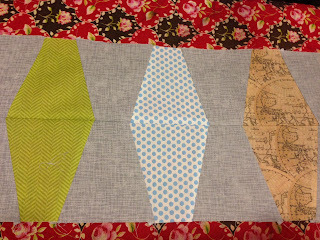 I hope despite the drab gray used in between the lanterns, it will be a striking quilt. 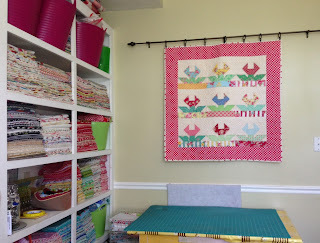 "I don't have a quilting space right now, but when my last child leaves for college in August, I WILL have my little creative spot. Thank you for the chance!" Congratulations to Cathy. And thanks so much to EVERYONE that played along. Happy weekend everyone. I've caught a bug so I'm going to try to rest and get better. I've been off visiting family for a few days. We had so much fun visiting my sister Paula in southern Utah. I went with my 2 daughters Shelbie and Whitney and we took my 2 granddaughters Allison and Eliza along with us. It was an amazing few days with my 2 nieces Tana and Tricia and their boys Maxx, Rex, Jens and Luke. 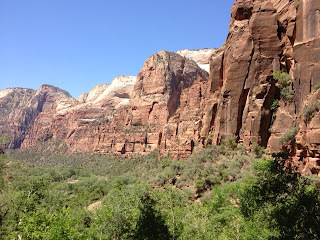 My sister and her husband Ken live very close to the mouth of Zions National Park. 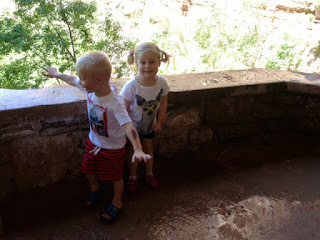 Some of kids and adults went on hikes in the breathtaking canyon. It was serious (second) cousin time for Jens and Allison. They bonded from the first moment and they can't stop talking about each other. I wish they lived closer. It was so fun to see Allison play with Jens and the other boys. This is Luke and Lizzie. 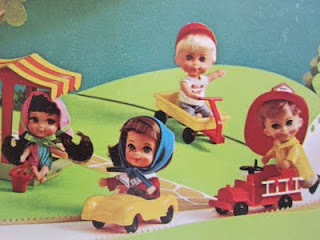 As 1 year-olds they enjoyed the typical floor time together. 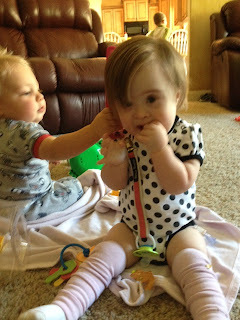 It looks like Luke is pulling Lizzie's hair, but trust me, they got along so well. It is back to business here with me working on binding my latest 6 quilts. I am really proud of my red herringbone quilt. 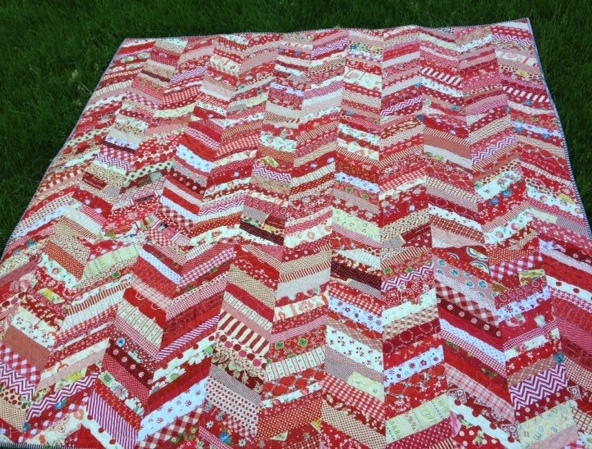 I had Wendy quilt in an extra warm batting because this quilt will be used on a bed when the weather gets cool. 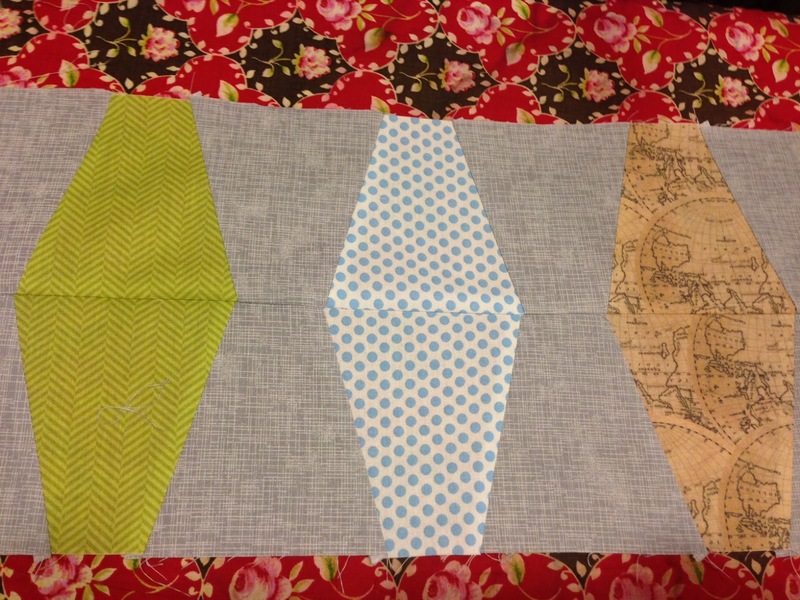 I pieced the backing. 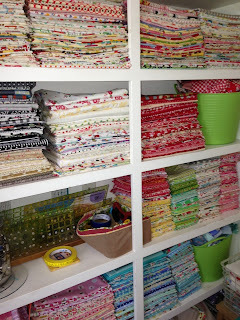 After reorganizing my fabric, I realized I need to piece more quilt backs and use up some that fabric I keep "saving". I realize the back looks kind of awkward so I'm going to work on putting those pieces together better next time. 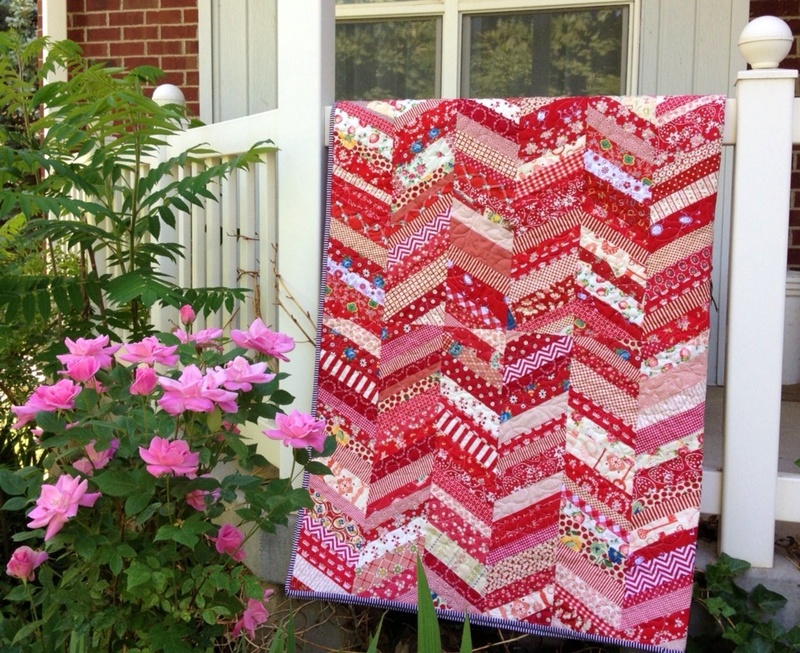 This herringbone quilt is a scrap quilt from front to back and I am proud of that. 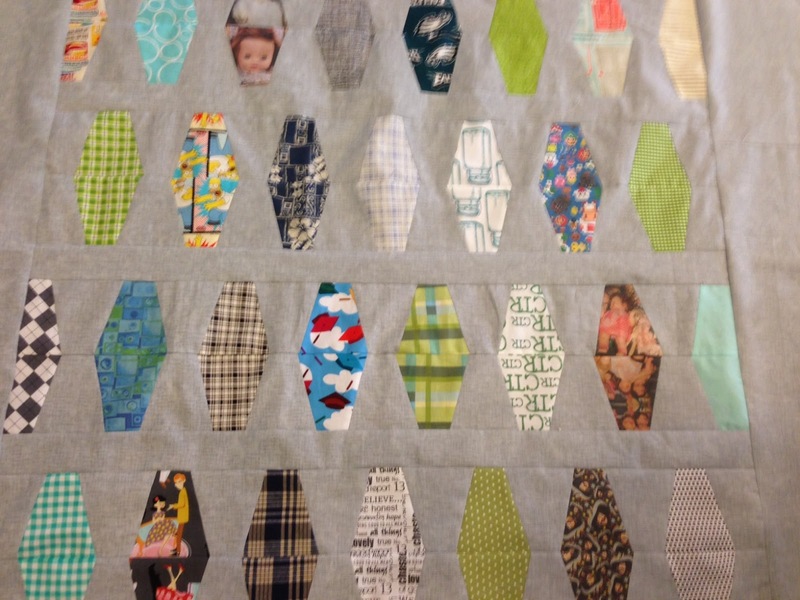 Scrap quilts speak to my heart. There are 3 rows of herringbone strips with 6 sets across. 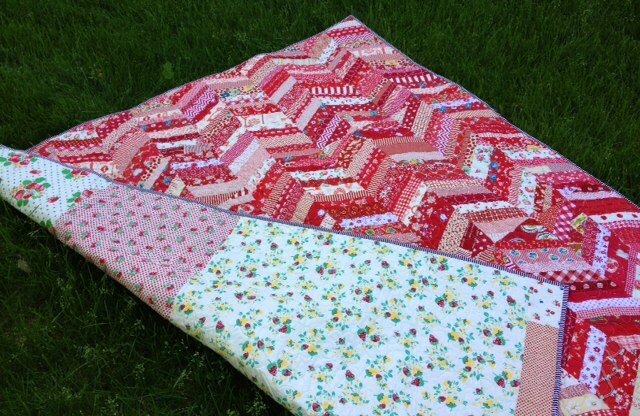 I'm going to make another herringbone quilt with light or neutral prints next. I'm excited to think about using up all those prints and novelty fabrics with light backgrounds. The binding is a black, white and red stripe. I wanted a contrast binding and I really like how Rita at Red Pepper Quilts uses a strong back and white binding on many of her projects. When we pulled up to the house after driving home from southern Utah, I noticed how intensely green my yard seemed after being in the desert. Zions Park is beautiful but it is nice to be home in my green yard and my house. Thanks to my sister, brother-in-law, nieces and great nephews for a fantastic trip. We can't wait to come back. 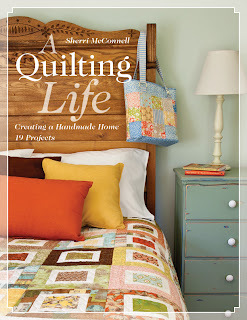 Thanks to everyone that entered last week's "A Quilting Life" by Sherri McConnell book tour. Friday, June 14, Sherri will be announcing winners then so check back with me and all the other blogs from the tour this Friday. I'm closing the comment portion so good luck to everyone that left a comment. 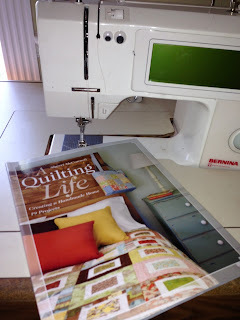 I really really enjoyed reading all about your sewing areas and how you make your own quilting life. The comments were all fantastic. 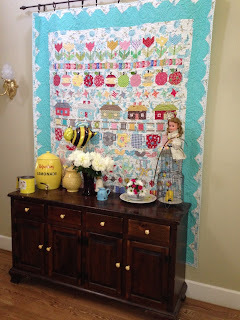 Welcome to day 1 of the blog tour for the book A Quilting Life by Sherri McConnell, published by C&T Publishing. A Quilting Life. 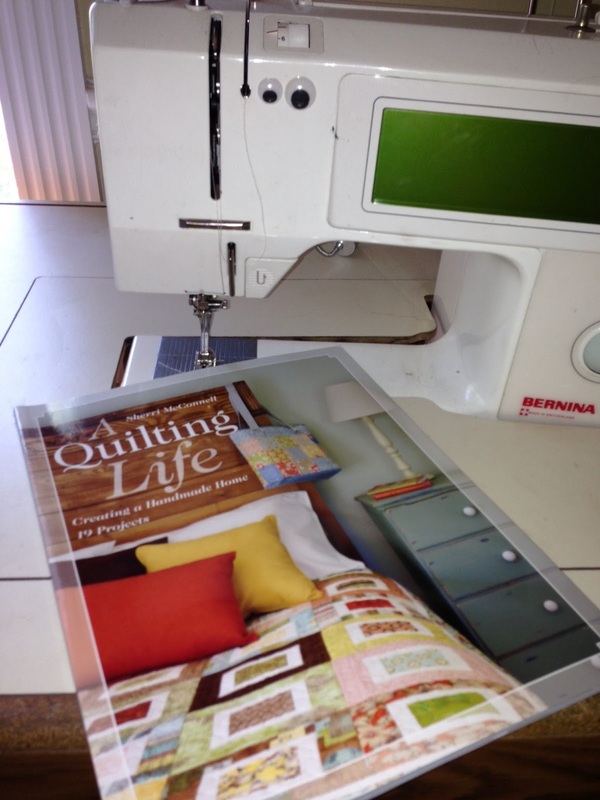 It is a great book with many ideas and designs to make and create things for your own home. If you follow the blog tour you have 10 chances to win a copy of Sherri's great book. 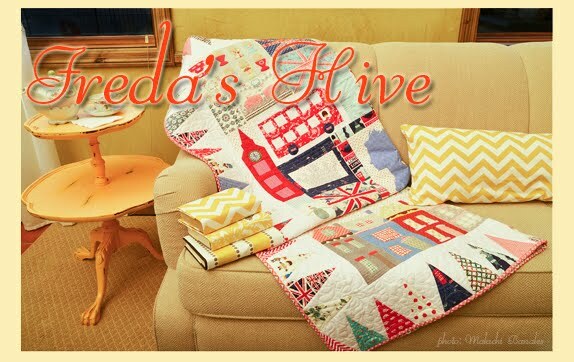 At my house, I've tried to live a quilting life myself. 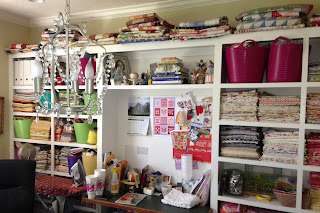 I think one of the things that has helped me live my quilting life is making a place for me to sew, create and display what I make. My entryway always has the latest creation hung for me to enjoy along with some favorite trinkets. 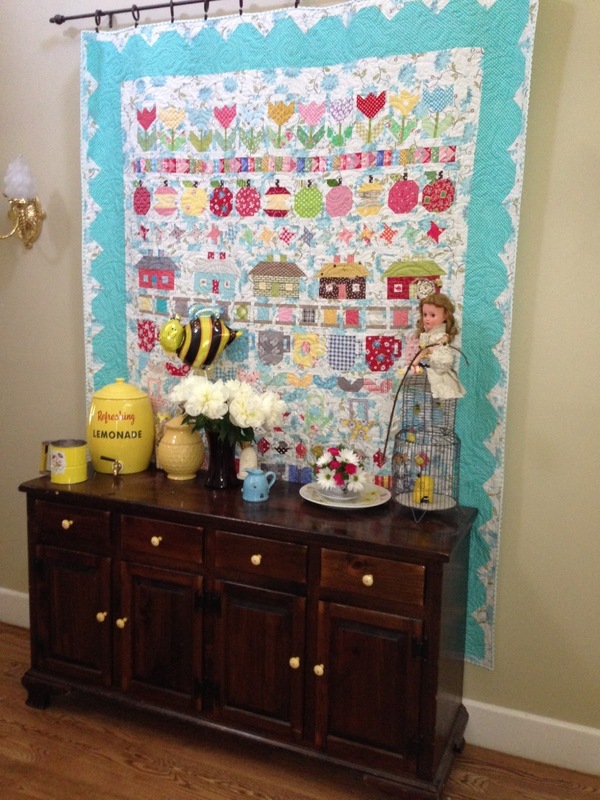 I was really happy to be able to hang my quilt from Lori's Row By Row project over the weekend. 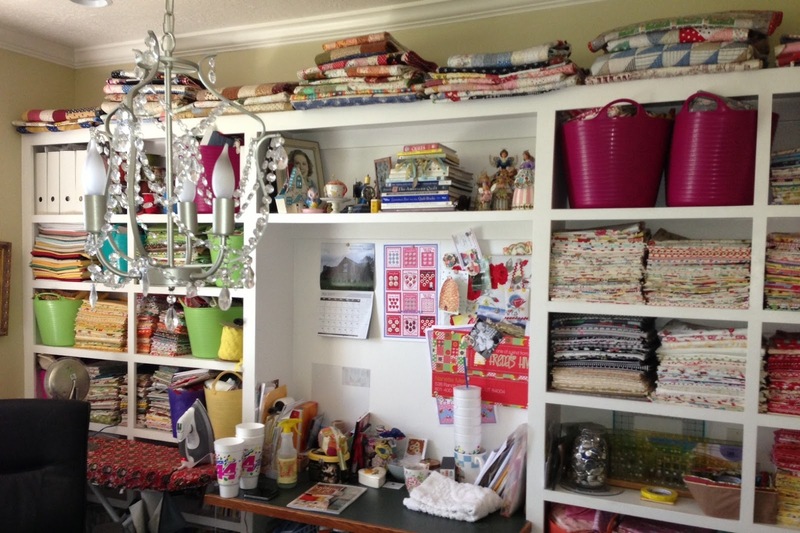 I think it is so important to carve out a comfortable, well organized space in your home where you can make your projects and live that quilting life. 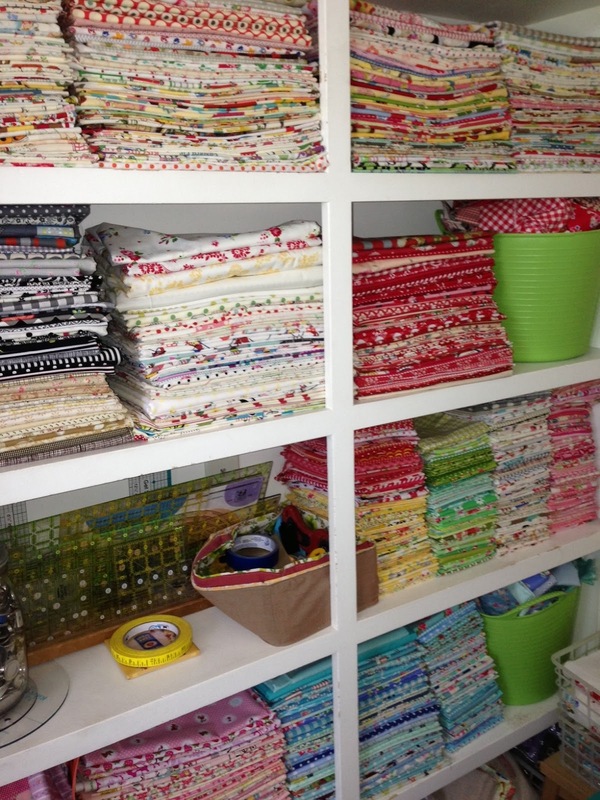 For me, if my fabric is organized and well displayed, my creativity is able to flow and I am able to relax and enjoy my quilting life. When things get too disorganized, I waste my time lose my creative spirit. For my birthday I recently spent most the entire day with some of my family helping me reorganize and get back to where I need to be with my fabric and accessories. It makes me so happy to have a clean room. 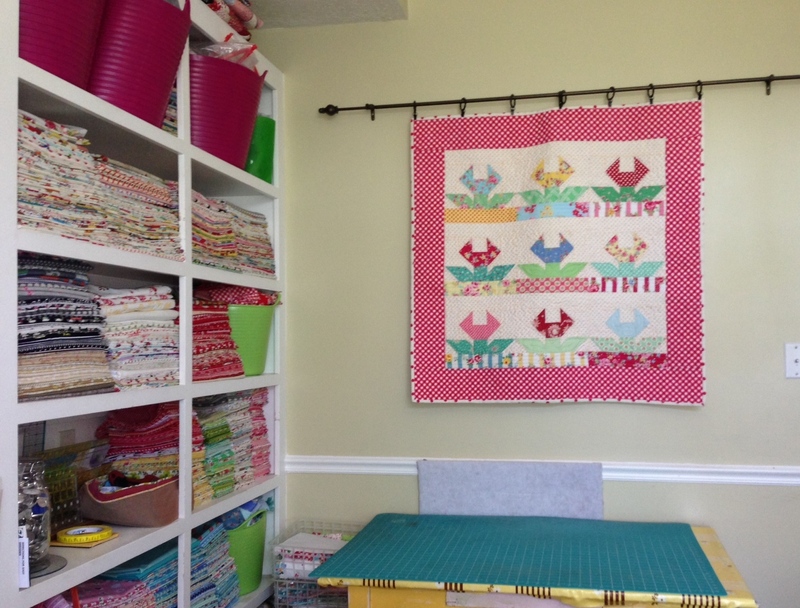 The room isn't perfect but it is a comfortable space for me to live my quilting life. Over the years I've moved my studio from room to room as family needs changed. 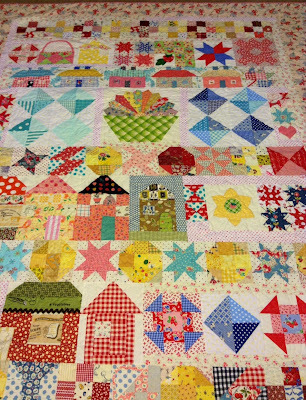 But I've always been able to carve a space just for me to enjoy my hobby and live my quilting life. This room is right off the kitchen so I'm able to stay close to the family and within range of happenings. 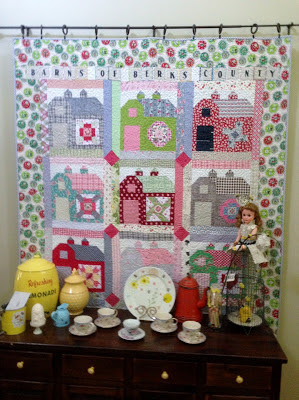 Leave a comment here and tell me about your quilting life space to win a chance for a copy of Sherri's book. Then for the next 9 days you can visit the other blogs on the blog book tour.